Hi, when sending a routine letter like an overdue invoice the only option is to send electronically, I have had clients who say they didnt receive the email, so now i’m resorting to trying to recreate the routine letter with the details needed to then send by snail mail. Any chance we can have a checkbox to send by snail mail both at the action screen and the preview screen, obviously we dont need to send the routine email that says “a new letter has been created for you click here” (or words to that effect) just the main letter. You may be able to address this by setting up an SPF record on your domain or configuring your own SMTP server. There is some guidance here on this subject, I strongly recommend you look into it. Regarding your second point, I’m not clear on what you’re looking for here? What do you mean by the “action screen”? I had set up my own server when i originally started using QuickFile, its not the actual sending thats the issue, more like unscrupulous clients. When i say the “Action page” i mean the page that shows you which accounts are overdue where you can send a email reminder to all selected, or on the left hand side you can click “Preview” before sending the reminder. Hope thats a little clearer. Fake invoices seem to be the latest fashion in spam so I think that we are going to suffer from more from false positives by security software or user’s eyeballs. Dont get me wrong, they received the quote, a letter and the invoice but state they haven’t had any of the reminders, its the reminders (or routine letters) that cant be sent by snail mail. 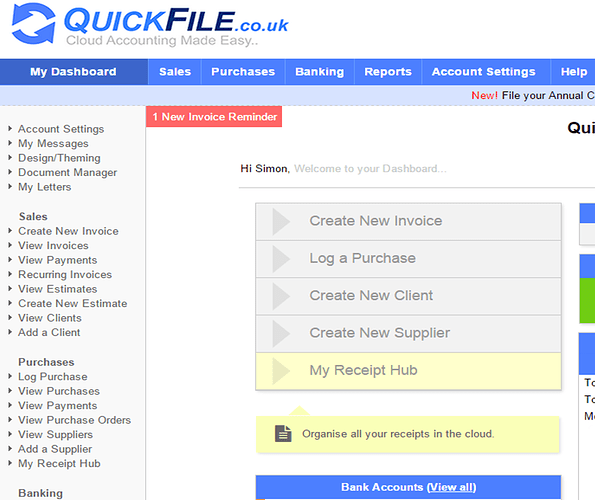 Yes at the moment there’s no support for sending invoice reminder letters (as we do with emails). In truth it will be quite complex to intergate this without creating a specific set of templates for print, the concept of templating isn’t supported by the letter creation module at the moment. An easier route would actually be to automate the sending of statements via snail mail. We already support the ability to send statements routinely when ever a balance exists. We would just need to connect this to the snail mail system. I’d support the idea of routine sending statements by post. For us we wouldn’t use it regularly but for certain clients it would be really useful. I also think that is a better solution than posting the invoice reminders as the statement can include several invoices information. The statement will show all outstanding invoices, and will clearly mark those overdue. It will also only send if there is a balance, so it’s quite useful for chasing later payers. I’ve asked for this to be reviewed. Just for clarity as i may not be explaining myself properly here’s some screenshots in order where i’d like to be able to click a checkbox to send by snail mail. So if im sending from the Second picture or the last i’d like to be able to send to snail mail as well, right now i’m copying the text, going to the clients “create a letter” from the dropdown, pasting the text and then changing the relevant parts for the data that should be there. Should we have to go the legal route with a client i don’t know what proof we’d have to provide to show that we’d been fair and timely in our notifications…etc, so being able to access all those sent and how they were sent would be invaluable. 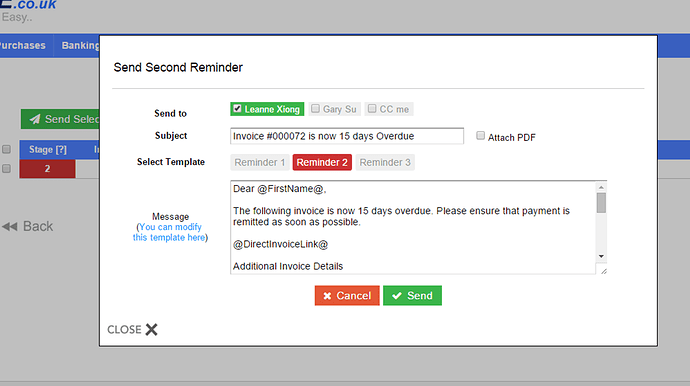 I personally think that the client statemen, which can already be sent by post, is also better than the invoice reminder as it can include several overdue invoices in one document. The only problem is the template for the reminders are intended to be sent by email, they contain hyperlinks. We’d need to create a parallel template for letters and allow it to be previewed within that modal window. I don’t really see how we could implement all that functionality into that window, without seriously cluttering the UI. Also bear in mind people will want higher levels of customisation later. What would be the possibility of recalling the sent email complete with filled data then? If it could be recalled exactly as it was sent it could then be printed off. Is that me just going round in circles, would it still mean further templating? This is just to remind you that the following invoice is now overdue. You can’t output that onto a letter and send it through the post. That’s the issue really, you’d need a completely unique template for snail mail.